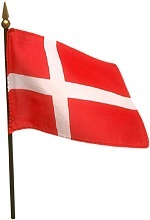 In Denmark, when it's somebody's birthday a flag is flown outside the window. For children's birthdays, parents place presents are placed around their child's bed while they are sleeping, so they will see the presents as soon as they awake. For older people in Denmark there is a special birthday tradition if that person has never been married: If a man or a woman has not been married, by the age of 30, he will be called a "pepper man" ("pebersvend") and she will be a "pepper maid" ("pebermø"). Friends give that person a peppermill or a pepper shaker to mark their birthdays!